This couldn’t have come at a better time. We have mother’s out of town so getting them a great gift can be challenging. We like to send a plant that will last a long time and our moms can enjoy it throughout the year. 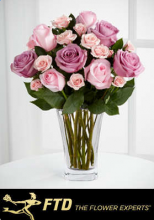 FTD has a great selection of flowers and plants for Mother’s Day and Living Social has a great deal available. Head over to Living Social and grab a voucher for $15 for $35 to FTD.com. Daily deals May 2, 2011 in LivingSocial, MothersDay · Expired! Are you going taking your mom out to eat for Mother’s Day? There are a ton of great Restaurant Deals available this weekend. Check out this list from SmartCouponing and Money Saving Mom! Let me know if you find a great deal! Click HERE to see the menu including some new items! Coupons May 7, 2010 in food, MothersDay · Expired! TCBY is offering a free frozen yogurt cup or cone for mom on Mother’s Day, Sunday May 8th! Go to TCBY to find a location near you. Call ahead to make sure your store is participating. Offers May 7, 2010 in free, MothersDay · Expired!